Beginning April 1, people living in rural areas need to have Aadhaar under Mahatma Gandhi National Rural Employment Guarantee Scheme that mandates 100 days work for a household annually. People registered under the scheme will be required to give proof of possession of Aadhaar or undergo the enrolment process till March 31, 2017, a senior officer in Cabinet Secretariat said. However, ration card, driving licence, voter identity card, Kisan passbook with photo, job card issued under MGNREGS and a certificate issued by a gazetted officer or a tehsildar will be admissible as proof of identity for people to get the benefits under the scheme till the time they get Aadhaar, he said. Those who have applied for Aadhaar can show their enrolment slip or copy of application made to the authorities concerned for getting the 12-digit unique identification number which acts as a proof of identity and address anywhere in the country. “Necessary orders to make enrolment of Aadhaar mandatory for states like Jammu and Kashmir and few others are being issued by the Centre in this regard. Adequate steps will also be taken to ensure that people face no problem in getting Aadhaar number,” the officer said. The government has invoked Section 7 of the Aadhaar (Targeted Delivery of Financial and other Subsidies, Benefits and Services) Act 2016 for the purpose. The section mandates that where government provides subsidy, benefit or service from Consolidated Fund of India, an individual can be asked to undergo authentication, or furnish proof of possession of Aadhaar number. The expenditure for the MGNREGS, which provides at least 100 days of guaranteed wage employment in every financial year to every household in rural areas whose adult members volunteer to do unskilled manual work, is made from the CFI. 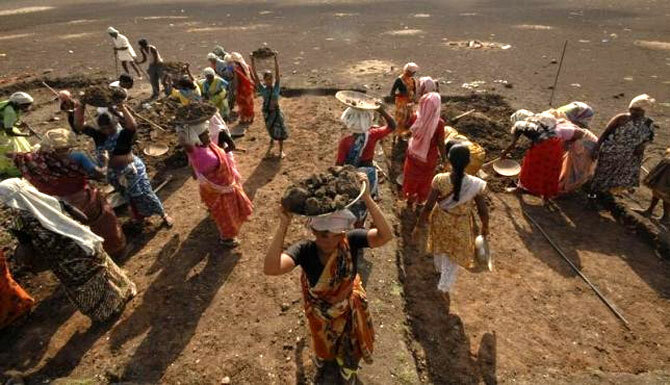 Rs 38,500 crore have been allocated for MGNREGS in the current fiscal by the Centre, an increase of over Rs 3,800-crore outlay made for the rural job scheme during 2015-16. The move to make Aadhaar mandatory for MGNREGS work will help in checking leakages of government subsidies and to ensure that the beneficiaries get their due, according to another officer who is part of the wing looking after implementation of the Centre’s Aadhaar-linked Direct Benefit Transfer scheme. The DBT programme, a major reform initiative to check leakages of welfare funds, was launched on January 1, 2013 with regard to 24 selected schemes of eight ministries. Through DBT all cash benefits are transferred directly to the beneficiary’s bank account. The Centre has asked all its departments and state governments to widen the scope of DBT scheme to include all monetary and in kind transfers to beneficiaries. In order to give further fillip to it, DBT Mission was last year shifted to Cabinet Secretariat and its implementation is being monitored by the Prime Minister’s Office. In a related development, retirement fund body EPFO has made it mandatory for its about 50 lakh pensioners and around four crore subscribers to provide either Aadhaar or a proof that they have applied for it till month-end to remain the beneficiary of its social security schemes.